What does the Bible teach about the Kingdom of God? Has it already been established? Or is it coming at some future time? Through the ages, the Kingdom and Kingship of Christ have been misunderstood, misrepresented, and misapplied. The Jews in Jesus’ day rejected Him. 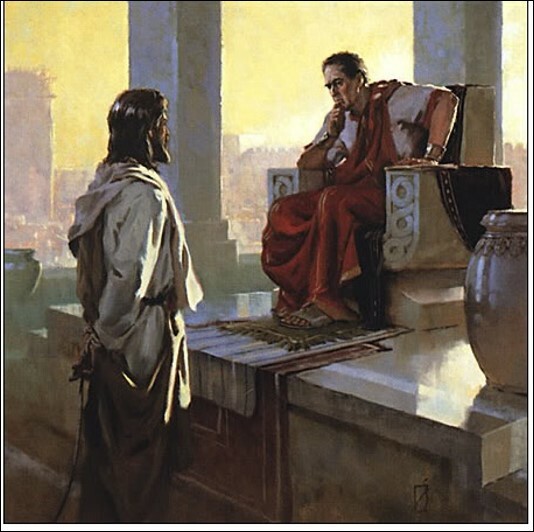 “He came unto his own, and his own received him not” (Jn 1:12) So, it’s little wonder that Pontus Pilate, the Roman governor presiding over His trial, was confused regarding Jesus’ work and role. “Are you the King of the Jews?” Pilate asked. “What have you done?” he wondered. To this Jesus responded, My kingdom is not of this world. If My kingdom were of this world, My servants would fight, so that I should not be delivered to the Jews; but now My kingdom is not from here.” (Jn 18:36). The Jews were hoping for a Messiah to reestablish the physical kingdom of Israel. When they saw that wasn’t His purpose, they were concerned about their positions of prominence. The Romans were afraid He was a threat to their power. And so, Christ was crucified. But their plan to rid themselves of Jesus played into God’s eternal plan to establish His Kingdom. What was misunderstood then, is also missed today. Christ, the King, rules over His Kingdom. Here and now. Not at some future time. John the forerunner of Jesus preached “Repent, for the kingdom of heaven is at hand!” (Matt 3:2). Later the apostle Paul would testify regarding the existence of God’s Kingdom (Ax 28:23). He said we have received it (Heb. 12:28). The Colossian Christians were in it (Col. 1:13). That Jesus Christ was now ruling and reigning as “King of Kings” (1 Tim. 6:15). And that at the end of time He will “deliver up the kingdom to the Father” (1 Cor. 15:24). Kingdom is simply a metaphor for God’s called out people–the church. Jesus spoke of it this way when he told Peter, “I will build my church… And I will give you the keys of the kingdom of heaven (Matt 16:18-19). On the day of Pentecost (Acts 2), Peter preached the first gospel sermon and opened the door for people to come into the church–the Kingdom of God. When Jesus said “my Kingdom is not of this world” He was saying it is a spiritual kingdom. It was not founded on worldly principles. It is not carnal in its nature. Its purpose is not secular. Nor is its means, methods and message political. Everything about Christ’s Kingdom is spiritual. Too often churches today forget their message, abandon their mission, and engage in a ministry foreign to the true purpose of God’s kingdom. The Good News of salvation is the main focus of the Kingdom. Seeking souls that receive it are “born again of water and the spirit” and become its citizens, as Jesus taught Nicodemus (Jn 3:1-8). The country club and carnival atmosphere of many modern day churches is inconsistent with the spiritual nature of the Kingdom. The Bible says, “For the kingdom of God is not a matter of eating and drinking but of righteousness and peace and joy in the Holy Spirit” Rom. 14:17). As Kingdom citizens, we’re admonished to consider ourselves as pilgrims and aliens in a foreign country. “For our citizenship is in heaven” (Phil 3:20). As such, our sojourn is to characterized by holiness. Our conduct is to be honorable. And our desires ought to be fueled by the spirit and not the flesh (1 Pet. 2:11). It is also well to remember in our politically polarized climate, that the hope of the world is not in a politician, political party, or even the greatness of America. It is in Jesus Christ. And in leading sinners into the citizenship of His Kingdom. The lyrics from the hymn of Albert E. Brumley challenge all of us.